MolSoft and Novartis Collaborate to Develop FOCUS - A global communication and modeling platform for medicinal chemists. MolSoft and Novartis have developed a new desktop modeling and communication environment for drug discovery called FOCUS based on MolSoft's Internal Coordinate Mechanics (ICM) software. The FOCUS platform is described in a publication in the ACS Journal of Chemical Information and Modeling (see Stiefl et al 2015). FOCUS is a platform that helps users communicate chemical and structural data, develop new ideas and support decision making during the drug design cycle. FOCUS can be integrated into an informatics and high performance computing environment giving the user a single interface to many capabilities. FOCUS is the result of more than ten years of collaboration between MolSoft and Novartis. Globally at Novartis there are around 1500 registered users and it has become a popular tool for medicinal and computational chemists as well as structural biologists and bioinformaticians. The core functions of FOCUS can be found in MolSoft's ICM-Chemist-Pro desktop modeling and cheminformatics software product (http://www.molsoft.com/icm-chemist-pro.html). FOCUS contains a wide range of applications including a comprehensive set of feature-rich cheminformatics tools and a 3D ligand editing and design hub. Using MolSoft's ICM scripting language Novartis created customized interfaces that enabled them to build fully interactive html pages, menus, dialogs, panels and table actions all linked to internal and external service calls. The FOCUS development team paid particular attention to make it user-friendly for non-computational researchers. The Novartis FOCUS development team worked closely with MolSoft's software engineers to build a chemically intuitive and user friendly ligand design interface called the ICM Ligand Editor. The Editor is integrated into FOCUS as well as MolSoft's ICM-Pro and ICM-Chemist-Pro desktop modeling and cheminformatics products. Using the editor, a ligand bound to a protein can be modified in 2D or 3D and the effects of the modification on binding can be immediately calculated and observed. Modifications are stored in the memory, which enables full undo and redo capabilities and the medicinal chemist can conveniently store new designs in fully interactive 3D spreadsheets. Rich graphics tools are available for the representation of the binding pocket surface and interactions between the receptor and ligand. The editor is powered by MolSoft's highly acclaimed ICM docking software and contains options for constrained, induced fit, fragment, and covalent docking. The ligand editor can also be used for 3D pharmacophore modeling using MolSoft's Atomic Property Fields. The publication describes the development steps that Novartis undertook in the development of FOCUS along with advice for people who want to build a similar platform for their company. If you are interested in finding out more please contact MolSoft (info@molsoft.com) or call 858-625-2000 x108. FOCUS was recently shown being used by Novartis scientists in a PBS documentary called "Cancer: Emperor of all Maladies". The image shows interaction of Novartis' cancer drug LDK378 with ALK. 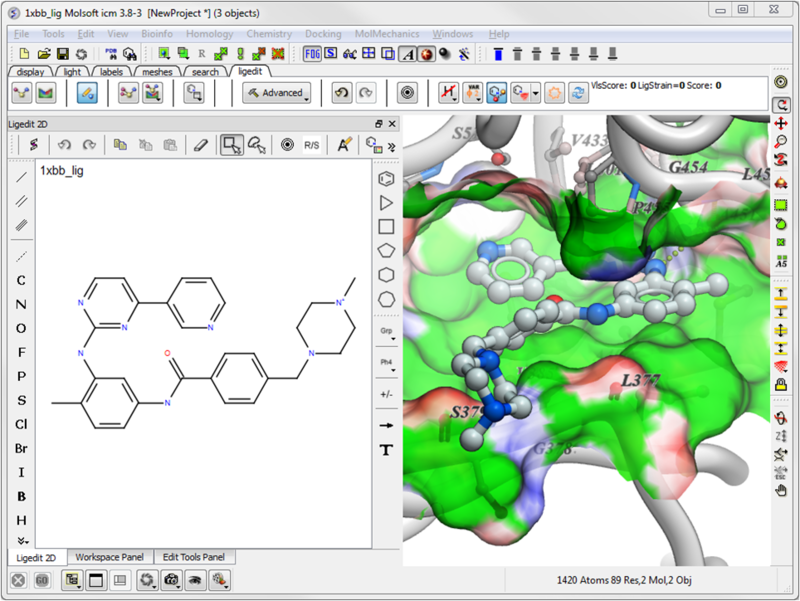 Screenshot of the ICM Ligand Editor which is incorporated into FOCUS. 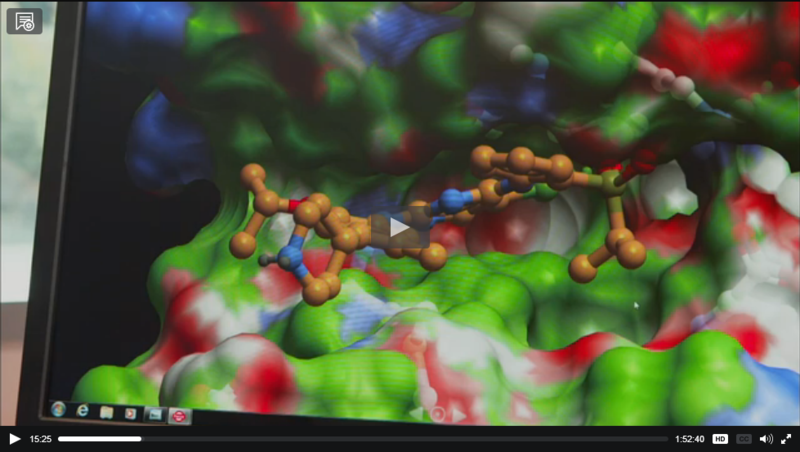 The ligand is displayed in 3D on the right hand side and the "one-click" editing tools are on the left panel.